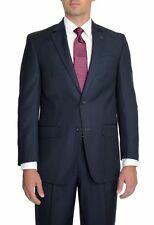 IZOD Classic Fit Blue Pinstriped Two Button Pleated Pants Suit. Condition is New with tags. Shipped with USPS Priority Mail. Size : 41R 34W. Color : Navy blue pinstriped. Size 40R: 44" bust, 41" waist, 18.5" shoulder to shoulder, 24.5" sleeves, 31" total length. Color: Black Striped. 2 button front. 4 button cuff. 3 pocket front. MSRP: Unknown. SIZE 50 REGULAR. JACKET IS GREY WITH LIGHTER PIN STRIPE. 2 POCKETS INSIDE ON THE LEFT SIDE OF JACKET. ONE POCKET ON RIGHT SIDE IN THE JACKET. ON THE FRONT OF JACKET THERE IS A POCKET FLAP ON EACH SIDE. We take care to list the materials of every item. Colors may vary depending on your monitor. I do my best to make any notes. I try to limit my correspondence after 7pm. I have limited access on weekends. Size : 38L 31W. Color : Charcoal gray striped. IZOD Cotton Pincord Striped Sport Coat. 2 outside pockets flap pockets. Size: Listed as a XL (but fits like a 46) based on the jacket length this could work as a 46L or 46R. 100% Cotton. Jacket is partially lined. Sleeve total extra material: 2". Sleeve Length: 25.5" (Seam at top of shoulder to hem or cuff). Chest: 44" (Armpit seam to armpit seam and doubled). 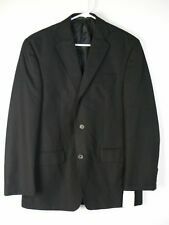 JACKET LENGTH: 32" (top of collar to bottom of jacket) SOLID - Light signs of character which may have a small spot or slight signs of use or missing button. SLEEVE LENGTH: 24" (top of shoulder seam to end of sleeve). Black Pin Stripe. Fully Lined w/a 2 Rear Side Vents. This Jacket is in Very good Pre-owned condition. Manufacturer Izod. Color Charcoal Gray. For the young or older male from high school to Yale. Material 100% Wool. Look sharp while saving money! Be sure to watch the exciting video to the left, below the featured product picture. Single breasted. Black with pindot vertical stripes. Size 46 Long. IZOD Men's Two Button Blazer Sport Coat Navy Blue Striped Size 40S Suit Jacket!! Length- (Collar seam to bottom hem) Aprox: 29.25". Sleeve- (Shoulder seam to cuff) Aprox: 24". Shoulder- (Shoulder seam to Shoulder seam) Aprox: 19". Length 35". Sleeve Length 26.5". Collar: Notch Collar. Pockets: Front Slip Pocket. Fabric Content: Polyester, rayon. Closure Type: Button. Care: Dry Clean Only. Front Style: Single Breasted. Fit: Classic. Lining Material: Polyester.